i have exactly 28 minutes before i hit the pillow. ya. i’ve set the time for me to go to sleep so that i have at least six hours of good rest before a whole restless day of meeting tomorrow. btw i’m in kk now. yes. i was here last weekend too. i guess kk is getting sick of me keep coming so it rained and spoiled my high hope to go to the island today *sob* before i boarded the flight this afternoon i was imagining myself lying on the beach (under a tree) with my book and a coconut fruit by my side while sneakily people-watching especially the hunky ones :p but as i reached, the rain ruined everything. it also killed my mood to shop. so i tried to take a nap but couldnt because my bb kept on alerting me with incoming notifications….. which were mostly useless ones. that’s when the first blur case started. bored while waiting for the boss to arrive. i wanted to hang my meeting attire and to my horror — what the heck??!!! my luggage pad lock?! it was fine. but i brought the wrong set of keys!!!! how can i open my luggage???!!! *panic* >.< but then i thought to myself 'it's ok, i'll try to crack it open by myself later. i used to successfully cracked one before with my hair clips. it should be easy.' ceh! so confident! but after struggling nearly an hour i gave up and called the hotel technical personnels for help who came and cracked it open within only one minute!!! ngeng!! kalau tau tadi baik call awal2 mau juga tunjuk terer. ceh! we went to the Philipines market which is just a walking distance away to buy me a three-chained-kebaya-brooches. after walking up and down the many stalls and rows of selling almost the same things and after much bargain i got a set that would match perfectly for my 2 kebaya(s). our dinner was the infamous bak kut teh in gaya street. sheeshh!! my friend has advised us to go before 7.30pm so that we could get seats. we arrived exactly thirty minutes earlier but the place was already full with hungry customers. lot’s of people stood by the many occupied tables to book their seats. mesti kah? but my my…. were we lucky or God just knew how hungry we were?! we went in and we got our seats right away because the customers at the table that’s nearest to us had just finished and went off. so apa lagi?! we sat. looked at each other in disbelief and questioned each other ‘are we really this lucky?’. the boss said ‘dont question. just be thankful to God that we dont have to wait’ lol!! we walked back to our hotel and passed by vedablu ice creams downstairs. and that’s when the second blur case occurred. right after the boss left. 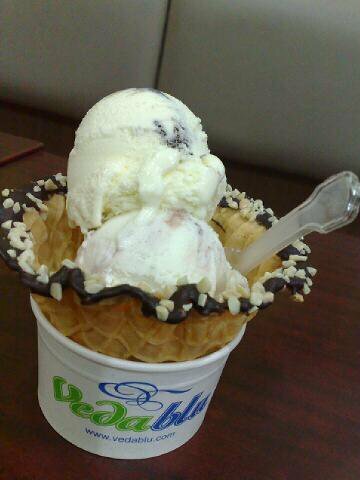 i succumb to the temptation of that sinfully creamy and mouth watery vedablu ice cream. i just have to have it or i will die! seriously. so i went down and ordered a 2-scoops in chocolate almond waffle basket. since it is impossible to have stone cold ice cream that i craved the other day vedablu is the nearest to look like one to satisfy my half fulfilled craving. at least 100x better than McD (but that one was a totally different story because it was the person who treated that matters most :p) so at the cashier, my ice cream cost me RM11.60. this is where it got interesting or more correctly – embarrassing. in my wallet my friend, has only one,( satu, yi, sebuleng, ji, yat) RM1 note!!!! ONE!!! the cashier looked at me blankly. i looked back at her blankly (but with a red hot face). then we both burst out laughing!! LOL!!! i asked her to charge the other customers while i SOS for help. the boss came down for rescue. phew!!!! and i can has my freaking expensive ice cream and dont have to die!! sorry for this boring entry. 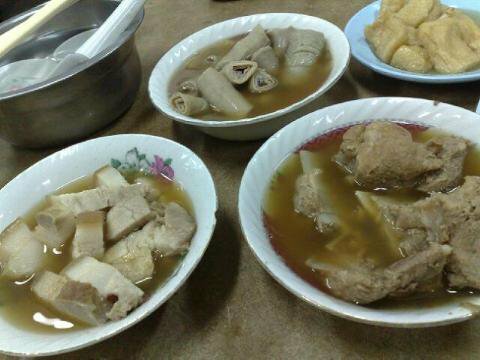 here’s a photo of the legendary bak kut teh. bak kut teh legend... haha!! and that irresistable ice cream that had me went through such embarrassing moment. siapa suruh manga? !